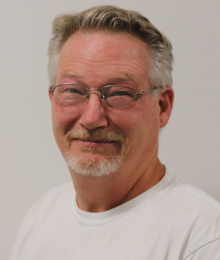 Dan Vitte, maintenance coordinator, has been with Marion County Board of DD since 2012 but has over 20 years experience in the field of maintenance. He also holds a degree business and graphic arts. Dan enjoys his job because of the variety of work. Having different challenges each day keeps things fun and new for him. His wish is for those we serve to be more deeply involved and more accepted in our community. He has learned that those served are wonderful people with huge hearts and a great outlook on life. Getting to know them is rewarding. Dan is a Fostoria native growing up in Rising Sun. Marriage to his wife of 26 years, Heidi, brought him to the area and they currently reside in Mt. Gilead. He has five children who have given him nine grandchildren with one on the way. His hobbies include church activities and aerodynamics.